Can Your Child Walk The Dog? Walking safely on leash is one of the most important forms of controlling your dog. A dog who tugs and pulls at the leash is not only annoying, but a danger to himself and others. Even a small dog can yank a leash out of his unsuspecting owner’s fingers and dash in front of a car. A large dog can do the same, but can also pull his owner right into the road with him. Owners of large dogs can have their fingers broken when their dog lunges at the leash unexpectedly, and may be pulled right off of their feet. 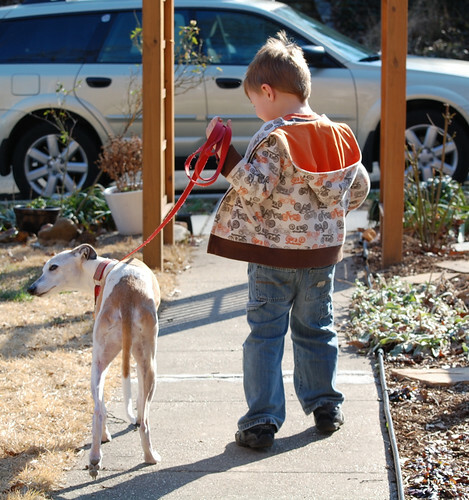 The pulling-on-the-leash problem becomes even more serious in a family situation. A pregnant woman is precarious on her feet at the best of times, especially in wet winter weather. A pulling dog is simply an accident waiting to happen. Children also love to walk the family dog, but again, even a small dog can pull a child right over. At Wag The Dog, we teach the entire family to control the family dog safely. While children and dogs should always be supervised when together, it is entirely possible to teach them to play and interact in a safe and controlled manner. When you have taught both child and dog how to handle each other properly, the bond between them can be a truly heart warming thing to witness. Some dog trainers refuse to work with child handlers, requiring an adult to handle the dog in training classes. Not at Wag The Dog. We love to include children in the dog training process. Even children under the age of two can be involved. The best part about teaching a dog to walk nicely on leash with a child is that it boosts the bond between them. Dogs tend to get the upper hand over toddlers, snatching food from their hands and bowling them over when they are excited. When the leash is handed to a small child, the dog tends to treat the child as nothing more than a post that he has been tied to, and he quickly finds out that he can pull free of the post. Training the dog to respond to the child’s instructions helps establish the child as “dominant” over the dog, and the frequent use of cookie rewards motivates the dog to follow the child. The most important part of this process is starting the training off-leash. If the dog learns how easy it is to pull the leash free from the child’s hands, he is rewarded for his efforts and more likely to do that again. If the dog pulls the child over, the child may be hurt, and safety is key in any dog training exercise! Instead, start in a fenced yard or in the house, and have the dog choose to follow the child for the sake of frequent treat rewards. You can attach a command to that, such as “follow Susie” or (as in the video example) “Go with Will”. The dog begins to feel that he is choosing to stay close to the child as he or she walks around, and there is no opportunity to learn bad habits. Only once the behaviour is well established do you want to actually try tying the dog to the child. Incidentally, this is the best way to train any dog to heel nicely on-leash: start off-leash! Remember that small children should always be supervised when walking or playing with the family dog, and that safety begins with teaching both child AND dog how to behave well around each other. This exercise works on both, which is why we love it so much! With a little work, you can help start a long and beautiful friendship. 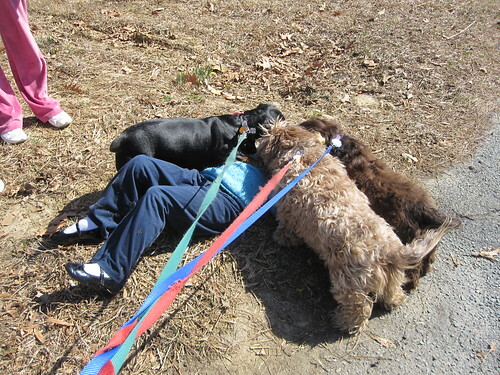 For more great tips on dog training, visit Wag The Dog often or follow us on Facebook.